Home › Common Problems › Bad Breath › What Age Should Kids Start the Zellies Complete Mouth Care System? What Age Should Kids Start the Zellies Complete Mouth Care System? Baby teeth can get cavities, but rarely show signs of gum disease. This means that a little xylitol each day should be enough to keep baby teeth clean and healthy. Xylitol will also help protect kids from “inheriting” bad teeth, passed from generation to generation in a family. Diet is very important for healthy teeth and kids usually love to snack. Ensure that kids snack on tooth-friendly foods like cheese, nuts, chicken and meats, rather than sugary or carbohydrate-laden foods. Use xylitol at the end of every meal and after sugary or acidic drinks. If your child has healthy teeth, xylitol makes a good choice for tooth cleaning. If your child has cavities, use a drop of ACT rinse on a toothbrush or a small amount of Crest Cavity Protection paste brushed onto teeth, twice a day. As adult molars erupt around 4-5 years old, ensure your child is getting regular xylitol. 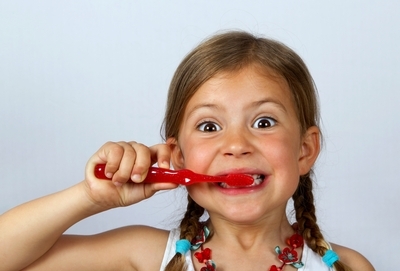 This may also be the time to perfect your child’s oral care routine. Adult teeth are at risk for cavities and gum problems. If you notice your child’s gums bleeding, this indicates a plaque problem. Untreated this problem can lead to periodontal disease that may affect your child’s general health and eventually lead to tooth loss. Teach your kindergarten child to brush their gums each day. Tell them to “massage” their gums with their brush – making little circles and brushing the outside and the inside of the gums. Stand behind your child and show them in a mirror how to reach difficult areas. This can be fun for both of you, and it will give your child a way to know how it “feels” to have a clean mouth. Use a rice-grain amount of Crest Cavity Protection paste on the brush. After brushing, instruct your child how to rinse with ACT anticavity rinse for one minute and spit out completely, several times. This routine should be sufficient to keep a young child’s mouth healthy, using xylitol and good gum brushing to keep teeth and gums clean and strong. If your child has bleeding gums, cavities, bad breath or eats a poor diet, then you may need to incorporate the other rinses of the Zellies Complete Mouth Care System. This system will also be useful for two years in advance of any orthodontic work. Braces on teeth can stress mouth health and makes cleaning teeth difficult. Use the Zellies Complete Mouth Care System before and after orthodontic work to ensure you avoid enamel scarring and keep your gums protected from damage. The transition to using the Zellies Complete Mouth Care System is a progressive event. As permanent teeth erupt around 5-6 years old – kids should be using xylitol and ACT – to protect the new adult teeth as they erupt. As children grow their permanent teeth (between 6 and 12) they should begin to integrate the rest of the system. Kids with gum problems or cavities, can benefit from the entire system to control disease more quickly than ACT and Zellies alone. For kids with bite problems – try to start using the entire system about two years before orthodontics and braces – to put the mouth in perfect condition before the start of this treatment. My three year old had bad breath, even though I was brushing his teeth. I put him on the xylitol right away. He listens very well, so I have him rinse with closys and I brush his teeth with a few drops of act and then he rinses with act. I also do your mints and gum (he loves the fruit mints/gum) and he no longer has bad breath. THANK YOU dr Ellie. I’m your #1 fan.